Dealing with flood cleanup in Gainesville, Florida, can be a stressful, time-consuming process, particularly if the damage is widespread. Depending on the level of damage your home or business has sustained, you might need mold remediation in addition to water extraction services. Your first step should be to call a professional restoration company in your local area to get everything started. They’ll take you through the process with ease. In the meantime, here’s a look at some of the commonly needed flood cleanup strategies. Before any work is accomplished, your water restoration teams completes a full assessment of the situation, determining exactly what steps are needed to restore the safe and dry condition of your home. 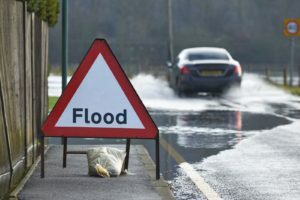 Due to the urgency that water overflows and flooding create, your team of restoration technicians should arrive shortly after your phone call. An essential part of the flood cleanup process, structural drying involves the use of air movers dehumidifiers, fans, and other methods to return your building to a state of dryness. Once this process is completed, the task of repairing damaged structural components (flooring, baseboards, drywall, paneling, and trim) begins. The equipment used is selected based upon the location and severity of the flooding. If your home or business has a crawl space built into it, you’ll need to have it checked for signs of flooding. Your team of restoration specialists will remove standing water and take steps to dry out the space in order to prevent mold or mildew growth. Crawl space cleanup might require the use of portable sump pumps and air movers to eliminate moisture. The vapor barrier will need to undergo a full inspection to ensure its integrity is intact. If it has been damaged, replacement is necessary, adding to the overall cost of your flood cleanup. Whenever an item is too damaged to be salvaged, it will need to be replaced. The cost of your flood cleanup can increase significantly if structural components are replaced rather than repaired. Whenever possible, repairs are incorporated to save time and money.